Player 1 passes to player 2 who checks of and seys to player 1. Players rotate positions. They work hard on checking away and then meeting the ball & getting the correct weight of the pass. This time realistic so looking to get space and be physical and push on your man. Set back. Alternate positions. Meeting the ball, 2 groups of 6, focus on checking away meeting the ball and then spinning off to support. See diagram for practice. 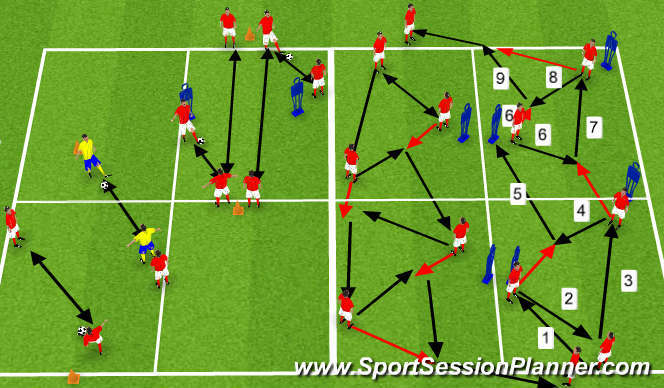 Development of last practice is to add in a goal but focus on the full back meeting the ball and playing in the winger who has to time his run or he will be off-side. He has to stay in line with the mannequin and then make his run to shoot first time across the face of the goal. Progression from previous practice session. 4 v4 + 4 + 2 with keeper. 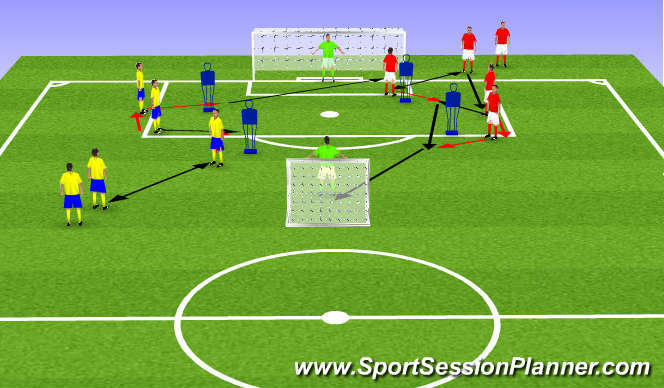 Set Up: Area 20 x 25 m.
The players have to play 10 passes and then play a through ball out. 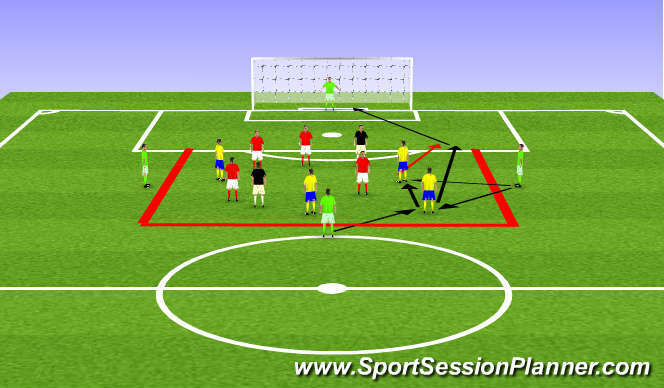 One player can go out to shoot against a keeper and a defender can track him and close him down and also leave the grid.As soon as they have left the grid then the coach gets another ball into the grid and starts the possession practice again. Focus on angles of support and the final pass.